Jewelry storage has been an annoying part of my day recently. I have a beautiful jewelry box that holds everything, but it is hard to see what I actually have when there are so many drawers and tops to open. I also tend to put everything away neatly every three months only to find myself laying all my pieces around the box once I have worn them. It is time to figure out something that actually works for me so I can see what I have and actually wear everything. If our closet was not already finished, I would be asking for one of these to be built in and have a mirror on the outside. I also love the idea of displaying your jewelry just as they would at your favorite boutique. 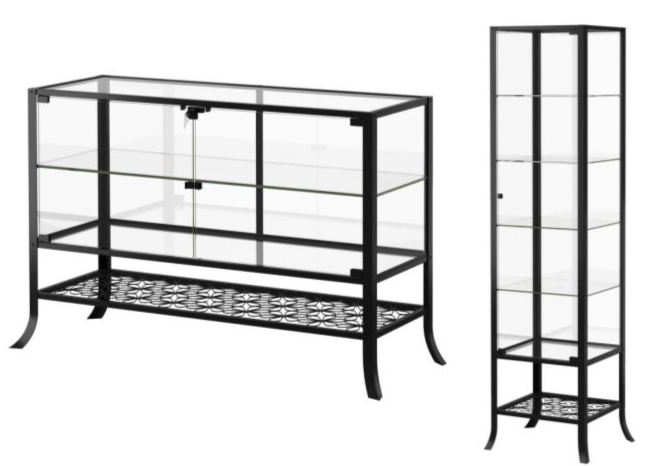 These glass cases from Ikea are a great example of how to do that and at a great price. 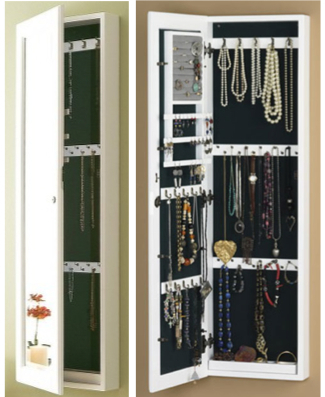 You could use trays, bowls, and jewelry hangers to add some depth so you can see everything. Maybe throw your clutches on the bottom of the large one for display? This wall mounted mirror from Target is great because you can actually check yourself out once you try something on. Our room has baseboards, so I cannot hang anything like this. I think the display case from Ikea is the way to go. Just need to check it out in person to see what it really looks like and how functional it might be. Great post! Jewelry organization is an ongoing struggle for me! Target and Ikea also have some cool options. I've also found that if you have room in your bathroom a cute tall/skinny vintage dresser can be the perfect house for scarfs, jewelry and other hair accessories. 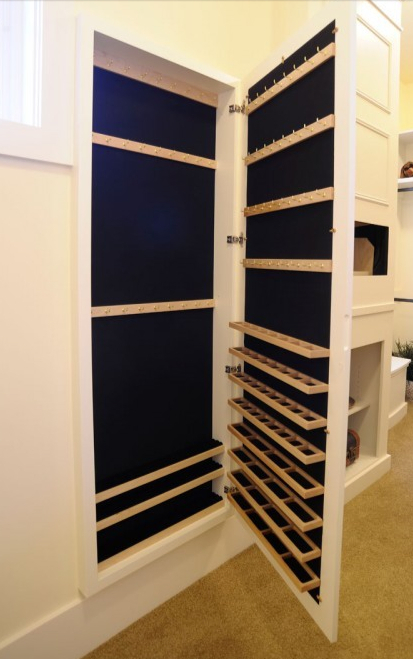 Cool ideas for built ins! Great ideas. I found you on a google search. Any idea where the top storage came from? I am designing my closet today and this is exactly what I have been looking for. That was a picture of a custom job. It would have to be designed by your contractor or closet designer into your space. It is such an awesome idea, I hope it works out for you! Thanks so much for the link to the Target mirror/storage. I've been looking for something functional and attractive and affordable, and I think this may be it! Home Decorator's collection has one now as well. Check out their site. I saw it in person and it is really nice. such a great way to store jewelry.